The day has finally come and we are both really excited to see our baby again. This time the scan is at our local hospital rather than the EPU and we are first to be seen. With another really full bladder we patiently waited for all the systems to be set up before we were called in, I was not as nervous this time as I was last time, I would say I was more relaxed and excited! The sonographer was lovely and went through with us all the checks that she was going to do. As soon as she started, we could see the baby on the screen as iit looked again like in had grown so much in just over a week. It was not moving as much this time as it looked like it was fast asleep, the sonographer did all the measurements she could in this position and then asked me to jump up and down to encourage the baby to move so she could get the NT measurement. After several times, she managed to get all the measurements she needed. The NT measured 1.4mm and CRL 59.9mm so she is not concerned. We were able to see the babies bladder and brain and well as all the limbs which was incredible. The scan was so clear, we could even see the baby rubbing it’s face! 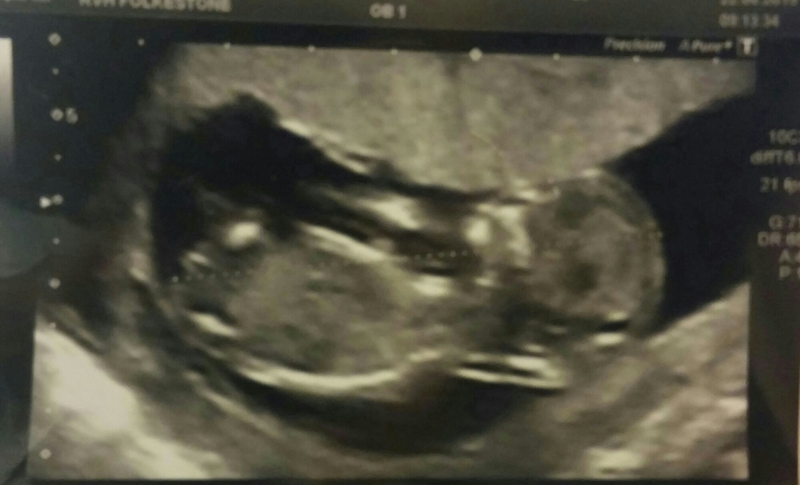 The scan put me a little forward in terms of dates at 12 weeks and 3 days, now due on New Years Day 2016! Off to have a blood test now as the other part of the 12 week screening. Counting down the days until we get to see our little bean again!